Sadao Watanabe (1913–96) was a printmaker celebrated internationally for his depictions of biblical subjects using traditional Japanese techniques. 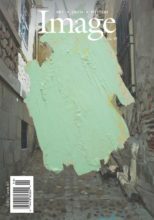 A longer version of this essay will appear in Beauty Given by Grace: The Biblical Prints of Sadao Watanabe, published by Square Halo Books in conjunction with a traveling exhibit sponsored by Christians in the Visual Arts. For dates and locations, visit www.civa.org. 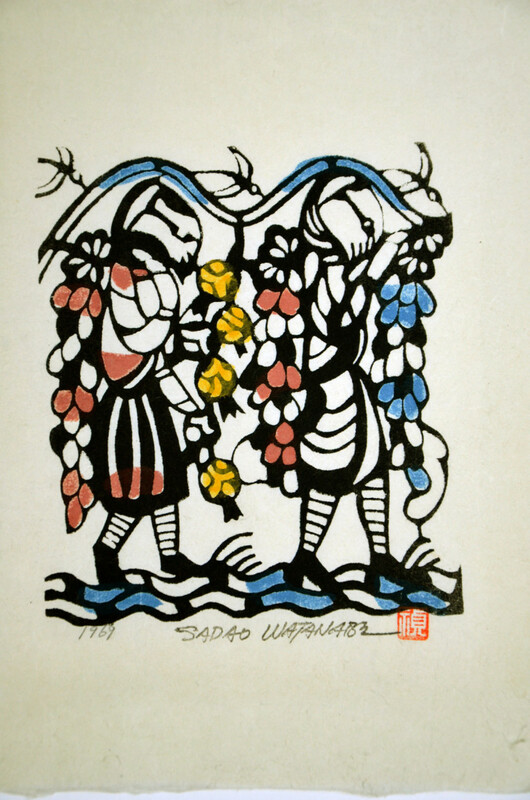 SADAO WATANABE WAS PROUD to be known as an artist-craftsman who used a centuries-old technique of textile dyeing to create contemporary art prints. With his glasses permanently perched on the bridge of his nose, he would kneel on tatami matting by a work table in a small studio in his Tokyo home and begin the laborious process of creating stencils, which served as the key blocks for his unique style of graphic art. Using sticky hair pomade, he would first affix a sketch of his subject to a specially treated sheet of thick stencil paper. Then he made cuts on both sides of the lines of his drawing with a small, sharp blade, carefully removing the excess paper. His experienced hand deftly turned the stencil patterns from side to side, making certain all parts of the emerging image were connected by lines. Printmaking was a family affair. His wife, Harue, had her own part to play in this folk art form, as exacting in its way as a traditional Japanese tea ceremony. She soaked the soybeans whose milk was used as a binder for her husband’s paints, straining it through cloth. She also mixed a paste from rice bran, sticky rice, lime, and salt to cover the colored sections of each print sheet, so that a final layer of black could be brushed on to bring out the lines marked by the stencil pattern. 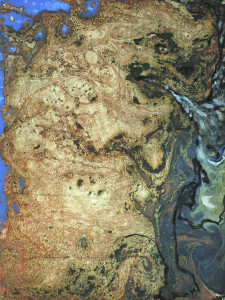 After the prints dried, Harue would rinse them in water and clean off the resist-paste to reveal the final colored image edged in black. While Watanabe cut stencils and his wife mixed paste and paint, the family dog kept watch on the matting beside its master. Watanabe devoted himself almost exclusively to depicting biblical scenes, from the Garden of Eden to the angelic trumpets at the end of time. He often cut his stencils while listening to Gregorian chant. The art of the European Middle Ages had a special appeal for him, since it came out of an era of shared Christian faith—when the church was the chief patron of the arts and commissioned pieces from skilled craft-workers whose names are now known only to God. Watanabe created many of his Bible scenes on huge sheets of textured paper, much like the folio parchment pages of illuminated manuscripts decorated by artist monks in the monasteries of medieval Europe. Mention Japanese graphic art to print collectors and specific images come to mind. Two fishing boats engulfed by a great, white-capped wave from the series Thirty-six Views of Mount Fuji by Hokusai Katsushika (1760–1849). Pedestrians caught in a sudden shower on an arched wooden bridge from the series One Hundred Famous Views of Edo by Hiroshige Utagawa (1797–1858). And, of course, countless portraits of courtesans in sumptuous kimonos and grimacing actors from Kabuki theater by woodblock artists like Moronobu Hishikawa (1618–1694), Shunsho Katsukawa (1726–1792), and Utamaro Kitagawa (1753–1806); these being the most popular subjects for ukiyo-e prints—the Art of the Floating World—so named for its depiction of fleeting moments of beauty and sensual pleasure. Watanabe, the Japanese Christian, stands outside this graphic art tradition, which defined images of Japan for the West in the early modern era. The beautifully coiffed, fine-featured beauties of the pleasure districts in ukiyo-e prints give way in Watanabe’s stencil art to immutable faces more akin to carved totemic masks, whose eyes stare with bold directness, looking at and beyond the viewer in the style of Eastern Orthodox icons. His scenes display none of the ephemeral effects of fog, rain, and the changing seasons which fired the imagination of the Impressionists and turned them into avid collectors of Floating World prints. Watanabe’s compositions have the permanence of the biblical scenes chiseled onto stone capitals in the Romanesque churches of France that he so admired. His is the art of eternity—not the passing moment. Watanabe invites us to enter a visual world both alien and familiar, bending cultural boundaries in his idiosyncratic mix of a Japanese folk art medium and Japanese visual motifs with the subject matter of western Christian art. His prints remind us that beauty is in the culturally conditioned eye of the beholder. A scene any westerner with the vaguest knowledge of the Bible will recognize as the story of Noah’s Ark looks to Japanese viewers more like a huge cricket cage filled with rats, tigers, oxen, hare, monkeys, and other animal signs of the zodiac. 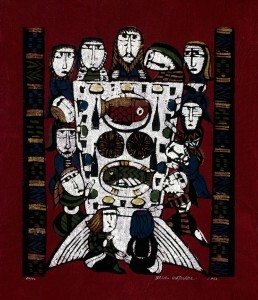 In Watanabe’s depictions of the Last Supper the main course is always sea bream, served on festive occasions in Japan. At the wedding at Cana, the guests eat lobster with the claws removed, a favorite dish at Japanese wedding banquets, where no scissor-like objects should appear on the table. Watanabe’s life story is about how he found a way through art to remain true both to his Christian faith and his Japanese cultural heritage. Christianity arrived in Japan on Portuguese trading ships in 1549. The first missionary efforts of the Jesuit priest Francis Xavier met with success, and a sizable Japanese Christian community formed in southern Japan around Nagasaki. The imported western faith was soon viewed as a divisive force by the Tokugawa shoguns, who had imposed centralized feudal rule after a period of civil war. A time of persecution began in 1612, culminating in the banning of Christianity and the expulsion of foreign missionaries. What was left of organized Christianity all but disappeared in the bloody repression of the Shimabara Rebellion of Christian peasants in 1638. Within a year, the sakoku (closed country) era began, and Japan shut itself off from the outside world. Only a tiny remnant of so-called “hidden Christians” kept the forbidden faith alive by worshipping in secret (described in Shusaku Endo’s novel Silence). Two centuries later, Christianity returned in the wake of the “Black Ships” of Commodore Matthew Perry of the US Navy. Japan was forced to accept the Treaty of Kanagawa in 1854, opening its ports to foreign trade. 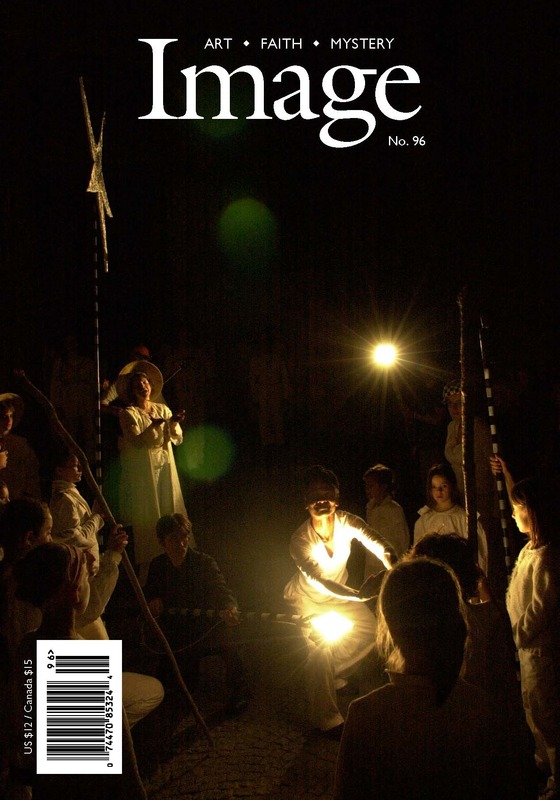 This time, the first missionaries to arrive were American Protestants, and their Christian message still came with a suspicious foreign accent. In the months before the attack on Pearl Harbor in 1941, the Japanese military regime forced over thirty of the country’s missionary-founded Protestant church organizations to merge into the United Christian Church of Japan, which Watanabe attended in the years he made his sacred stencil art. Several communities broke away from the alliance in the post-war years, but the UCCJ remains the largest Protestant church in Japan. Today, when Japanese Christians of all varieties—Protestant, Roman Catholic, and Eastern Orthodox—are counted, their numbers do not add up to two percent of the population. Watanabe’s conversion was no road-to-Damascus experience. Choosing to follow Christ can lead to family division and social ostracism in a country where consensus is highly valued, so he came to his decision slowly. A Christian schoolteacher invited him to church, and he compared the claims of the Bible with Buddhist texts. Watanabe had ample time for reading during two years he spent in bed with tuberculosis, and he believed his eventual healing came about through the power of prayer. 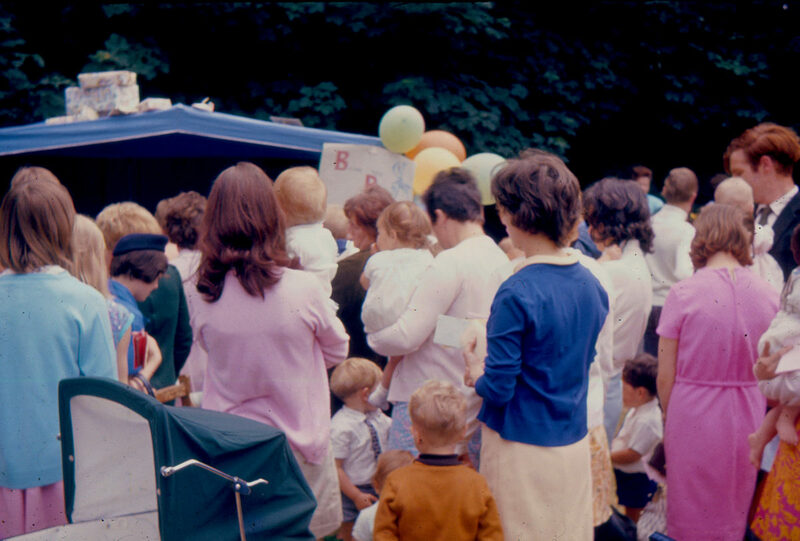 He was baptized in September 1930. His mother followed his example on Christmas Day. Once Watanabe made his commitment to Christianity, he wanted to dedicate his talent to the glory of God. Discovering just how he would do this did not come easily for an artist in his late teens who had dropped out of school and was still in search of a suitable profession. Watanabe drifted in and out of jobs where he could use his drawing skills. He even worked for a time in the anatomy room at the medical school of Tokyo Imperial University, making sketches of the structure of human eyeballs taken from dissected corpses. In his early twenties Watanabe became apprenticed to a textile dyer, moved into his shop, and mastered the traditional craft of coloring kimonos and obi sashes. He was finally getting his artistic bearings, studying pattern books with designs from as early as the fourteenth century. Designing kimono fabrics awakened Watanabe to “the beauty and wonder of the Japanese style of expression and the Japanese sense of nature.” But how relevant was his growing appreciation of Japanese art to his faith? Browsing the shelves in a Christian bookstore one day, Watanabe was struck by the fact that almost all the covers were illustrated with pictures of European religious paintings and sculptures. There was nothing that spoke to the Japanese in their own visual language. Japanese Protestants had followed their American missionary mentors in emphasizing the primacy of the word over images. What art they did produce was in a saccharine, sentimental, western style, incapable of expressing the vitality of the biblical message as Watanabe believed it should be portrayed. “There seems to have been a certain suspicion of too strong an interest in beauty, and we now feel our artistic poverty very acutely,” he said. “My task is to stand within the artistic tradition of Japan.” He found the way to do this in a Tokyo department store. After the Meiji Restoration of 1868, Japan rapidly adopted western culture and technology in an effort to accelerate the pace of economic and social development and catch up with the industrialized world. A growing tendency to value all things foreign and neglect traditional culture was viewed with alarm in Japanese intellectual and artistic circles, giving rise to an anti-industrial folk art movement in the mid-1920s. The movement took the name mingei, a neologism formed from the Chinese characters min (people) and gei (art)—also shorthand for minshuteki kogei (popular handcraft). To reach as broad an audience as possible, the Mingei Association organized exhibitions in Tokyo department stores, promoting the works of movement artists like Keisuke Serizawa, who made handcraft objects using a cloth dyeing technique from Okinawa. One visitor to the Serizawa show was the twenty-four-year-old textile dyer Watanabe. He looked back on that day in 1937 as a turning point in his life. In the early 1940s, Serizawa became a mentor to a group of aspiring stencil print makers, including Watanabe. Serizawa was stern but fair with this Christian student who was determined to make stencil art on biblical themes. 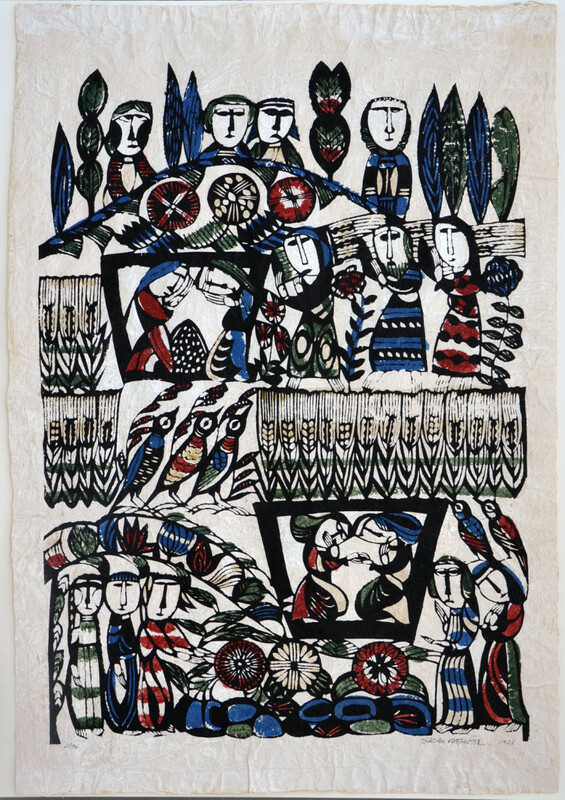 In 1943, Watanabe submitted one of his first sacred art prints on the story of Abraham to a juried Tokyo craft exhibition. The piece impressed a majority of the judges, but Serizawa insisted that it was unfinished. Watanabe obeyed his teacher and withdrew the print. Through Serizawa, Watanabe came to know Soetsu Yanagi, the main theoretician of the mingei movement, and found his faith bolstered in an unexpected way. Yanagi represents a generation of cosmopolitan Japanese intellectuals who used critical categories shaped by their study of western art to develop a modern Japanese aesthetic based on the appreciation of traditional forms. Early in his career, Yanagi had studied William Blake and Walt Whitman and helped found Shirakaba (white birch), an influential journal devoted to western art and literature. He was an avid reader of the writings of Christian contemplatives, Sufi mystics, and Zen Buddhist masters and took an interest in the gothic art of medieval Europe and its guild system. Yanagi’s enthusiasm for common Korean ceramic ware, much prized by practitioners of the Japanese tea ritual, shifted his perspective away from Europe and towards Asia. He constructed his theoretical framework for the mingei movement on the foundation of Buddhist concepts of art but was equally comfortable quoting Meister Eckhart and Thomas Aquinas. Art and religion were inseparable for Yanagi. He attributed the ugliness of modern artifacts to the “loss of faith.” In Yanagi’s view, artists were like disciples of the Buddha seeking enlightenment. 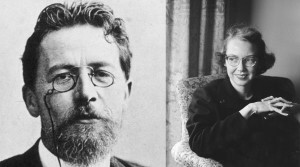 They had two paths to follow: the way of self-assertion and self-power or the way of surrender to a higher power and reliance on grace. The artist-craftsman who chose the way of humility rather than self-promotion could not fail to produce beautiful works of art, if he remained true to traditional methods. The salvation of industrialized society would ultimately come about through the beauty of objects made by “natural material, natural process, and an accepting heart.” Yanagi’s concept of beauty given by grace perfectly expressed Watanabe’s own sense of mission as a Japanese Christian artist. Plate 1. Sadao Watanabe. The Story of Ruth, 1966. 2/50. Hand-dyed kappazuri stencil print on momigami paper. 34 x 24 ¼ inches. All works from the Bowden Collections unless otherwise noted. 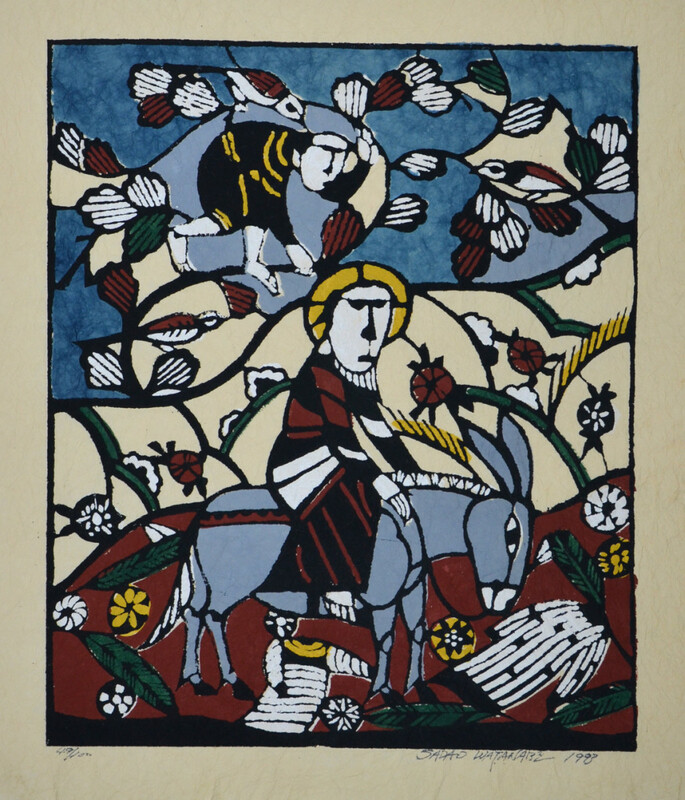 Dedicating his life to Christian stencil art was an audacious act for Watanabe. Japan was losing the Second World War, the future was uncertain, and he now had a wife to consider. In 1943, Watanabe had married Harue Yoshimizu, who came from a papermaking family. She was expecting their first child in the winter of 1945 and had been evacuated to the countryside when the Watanabe home in Tokyo was destroyed in a bombing raid. Watanabe collected what remained of their belongings and made the thirty-mile journey by bicycle in bitter winter weather to join his wife and mother-in-law in the town of Ome. What were supposed to be temporary living quarters became their home in the first desperate years after the war. A daughter, Yoko, was born in 1945. A second daughter, Yuko, was born three years later. 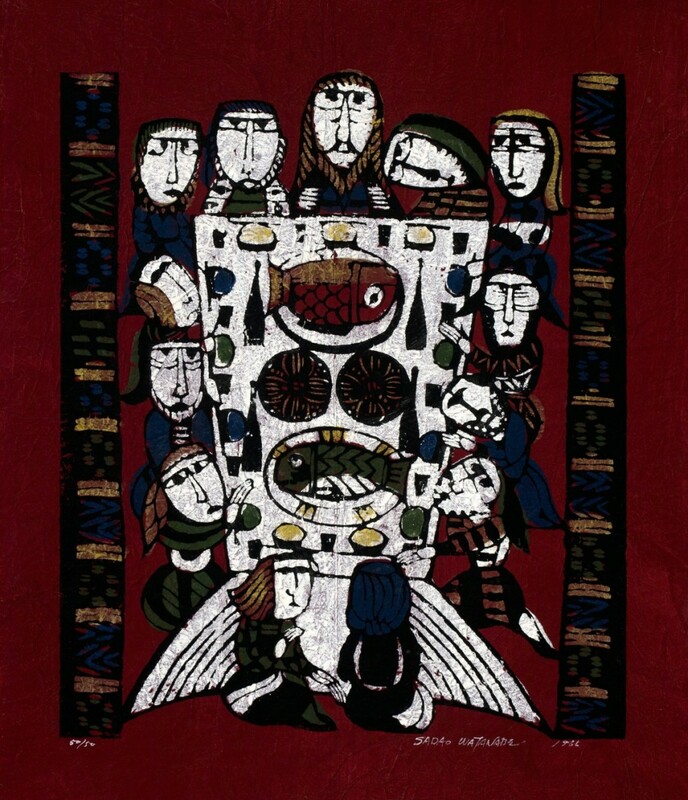 Watanabe was in poor health and barely earned an income making designs for a futon factory and loading moving vans, but he continued experimenting with katazome art portraying biblical themes. 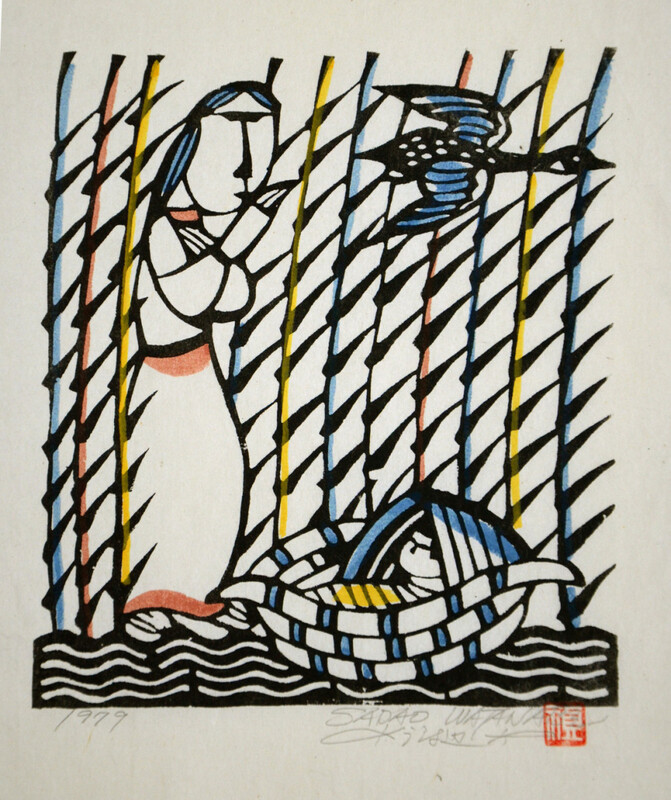 A remarkable stencil print came out of these grim postwar years illustrating the story of Ruth, a woman who also endured great dislocation and deprivation before she became, in Watanabe’s words, “the recipient of God’s favor, who lived a life filled with God’s blessing.” The piece won Watanabe the first Japan Folk Art Museum Award in 1947 [see Plate 1, a later version]. Since the museum had been founded in 1936 by Yanagi, who was also its first director, the honor was especially gratifying for Watanabe. This time, Serizawa praised his pupil’s work. 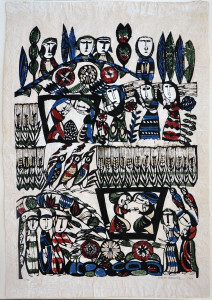 Twenty-three figures crisscross The Story of Ruth, suggesting the continuous narrative imagery of emaki art, where a story unfolds in pictorial episodes and is read by unrolling a long horizontal scroll. Serizawa’s influence is clearly visible in the multi-tiered, flattened perspective. For western viewers, the tale of Naomi and Ruth may be hard to decipher in the myriad of details, but the repeated decorative motifs of grain stalks, flowering vines, and frieze-like figure arrangements link the stencil print to the visual traditions of Japan. We delight in Watanabe’s stencil prints because he makes us see familiar Bible stories through Japanese eyes as if for the first time. He was especially drawn to the subject of the Last Supper, since thirteen figures eating at a furnished table could be depicted in a number of different ways. The menu is typically Japanese: sake, sushi, and sea bream, served whole on a plate with the head to the left of the honored guest [see Plate 5]. How we view the scene is just as important as what we see in Watanabe’s biblical prints. The artist uses a shifting perspective, where narrative importance determines position and size, much in the style of Eastern Orthodox iconography. In many Watanabe studies of the Last Supper, the figure of Christ looms larger than the disciples. He is placed at the center of the longer end of the table at the top of the picture, while Judas sits with his back turned to us at the shorter end—in what would be the foreground, if western rules of perspective applied. The mingei ceramic ware on the table is seen from above, while the sake bottles are viewed from the side, both in their most recognizable positions. Like the medieval artists he admired, Watanabe is more concerned about telling a story than recreating a plausible physical world. Plate 5. Sadao Watanabe. The Last Supper, 1966. 50/50. Hand-dyed kappazuri stencil print on momigami paper. 21 x 17 ½ inches. In Watanabe’s natural order, the trees of the wood rejoice, the mountains skip like rams, and the floods clap their hands as in the Psalms. Details from nature not only define setting, they participate in the drama of the stories. 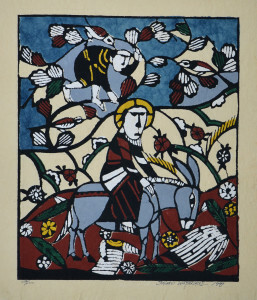 A pine tree does rejoice in the small-format washi (plain mulberry paper) print The Good Shepherd, bending solicitously over the shepherd who takes the lost sheep into his arms; yellow and white arcs of undulating hills or bending palm fronds dance beside the manger in The Nativity; and the troubled sea in Boat in the Storm extends its claws to seize the crowded vessel holding the disciples and the sleeping Jesus. Watanabe was well versed in the language of flowers, garlanding his scenes with morning glories, cherry and plum blossoms, chrysanthemums, and other beloved Japanese flora. In Eve and the Serpent, flowers grow in wild profusion in the Garden of Eden moments before Eve takes the forbidden fruit; in The Annunciation, they form a decorous bower of blooms, recalling medieval imagery of the Virgin Mary as an enclosed garden. Plate 2. Sadao Watanabe. Moses Abandoned, 1979. Hand-colored kappazuri dyed stencil print on washi paper. 7 ¾ x 6 ¾ inches. From the Sacred Art Pilgrim Collection. The stencil artist was fond of birds and kept one in a cage in his studio. He cut at least seven large stencil images of Saint Francis Preaching to the Birds and included them in dozens of biblical prints, often in the most unexpected places. A feathered trio keeps watch from the treetops in Sacrifice of Isaac; a disturbed duck flies out of the bulrushes by the Nile in Moses Abandoned [see Plate 2]; and crows steal fruit in Harvesting the Grapes [see Plate 3]. Watanabe even perches a bird on Christ’s shoulder in one washi print of Jesus washing Peter’s feet. Watanabe devoted at least five prints to an avian theme seldom depicted in western religious art: the story of the miraculous appearance of quail to feed the hungry Israelites in the wilderness. His first kappazuri work on the theme, The Girls and a Lot of Quail, was honored by the Japan Print Academy in 1956. The subject had special resonance for an artist who lived through the severe food shortages of the postwar years. God not only sent quail to feed the Israelites in the Bible story, God’s eye was also on these non-migrating birds, providing for their daily needs. It was an object lesson in God’s grace in ordinary life. Plate 3. Sadao Watanabe. Harvesting the Grapes, 1969. Hand-colored kappazuri dyed stencil print on washi paper. 7 ¼ x 6 ½ inches. From the Sacred Art Pilgrim Collection. Plate 4. Sadao Watanabe. Triumphal Entry, 1993. 49/100. Hand-dyed kappazuri stencil print on momigami paper. 21 ½ x 17 ½ inches. A quiet, reserved man, Watanabe revealed a droll sense of humor in his biblical prints. In some versions of The Wedding at Cana, servants can be seen furtively dipping their fingers into the water pots to sample the miraculous vintage of wine before passing it on to the guests. There is a bit of Buster Keaton in the woeful-faced farmer in a 1965 washi print, The Parable of the Sower and the Seed, who stares out at us helplessly while a pesky crow, almost half his size, snatches up the seed. In The Angel Appears to the Shepherds, Watanabe includes two black sheep in the flock these shepherds watch by night. The katazome master was once asked why he chose to depict the three kings paddling for home in a boat. He had a wry answer no biblical scholar could dispute. As Watanabe pointed out, Matthew 2:12 clearly states that after being warned in a dream not to return to King Herod, the magi “departed into their own country another way.” If they had come by land, why not return by sea? One striking feature of Watanabe’s biblical characters is their impassive, tight-lipped faces. They inhabit a different spiritual space than the swooning saints who roll their eyes heavenward in grief or ecstasy in much western religious art since the Baroque period. The notion that expressed emotion reflects deep devotion is foreign to Japan, where social convention discourages the public display of feelings. Watanabe’s figures resemble actors in traditional Noh theater, who perform behind masks and communicate emotion through body language. Look away from the faces in Watanabe prints and focus on the gesticulating, oversized hands and razor-sharp fingers. Hands with palms outward command attention and offer blessings; hands with palms inward signal fear, wonder, and joy. Pointing fingers mark authoritative words and sins acknowledged. In the momigami print Mary Magdalene, a circle of hands enfolds and protects the woman who has just been cleansed of seven demons. One grieving female figure does discreetly wipe a tear from her eye in Descent from the Cross, but she figures in a composition that echoes European studies of the deposition by Rembrandt and Rubens [see Plate 6]. Plate 6. Sadao Watanabe. 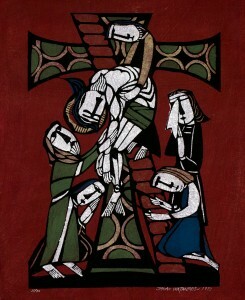 Descent from the Cross, 1973. 35/70. Hand-dyed kappazuri stencil print on momigami paper. 25 ¼ x 17 ½ inches. Watanabe needed to draw on time-honored prototypes from the sacred art of Byzantium and western Europe if his biblical themes were to be understood. Place adoring figures around a mother and child and you evoke the Nativity, however exotic the surrounding details may be. Yet, as a Japanese Christian artist looking in from outside, he felt free to interpret western visual conventions in his own way. The motif of “the disciple whom Jesus loved” leaning his head toward Christ in iconography of the Last Supper also appears in Watanabe prints of Christ at Emmaus to convey the intimacy of the moment when the risen Christ breaks bread with the two disciples. In Watanabe’s version of Abraham’s sacrifice of Isaac, the father of the Jewish nation offers up his only son and heir as a babe-in-arms while the ram leaps forward, begging to be accepted as a sacrifice. Some Watanabe subjects, like the story of Isaac and the wells from Genesis 26, almost never appear in western art and require knowledge that most western Christians lack. Watanabe shared the view of his mentor Yanagi that preconceived ideas and personal tastes distort the way we view art. 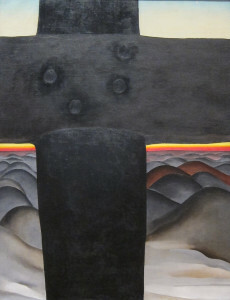 The mingei philosopher thought a true understanding of the essence of things could only come about through “direct communion between the eye and the object.” For Watanabe, the application of this concept took a form very similar to the visualization prayer described in the Spiritual Exercises of Saint Ignatius of Loyola. The story of Jesus washing the disciples’ feet served as a perfect example. “We are not to look on as observers,” Watanabe explained. “We must enter into the story and become one of Jesus’s disciples, so Jesus washes my feet. 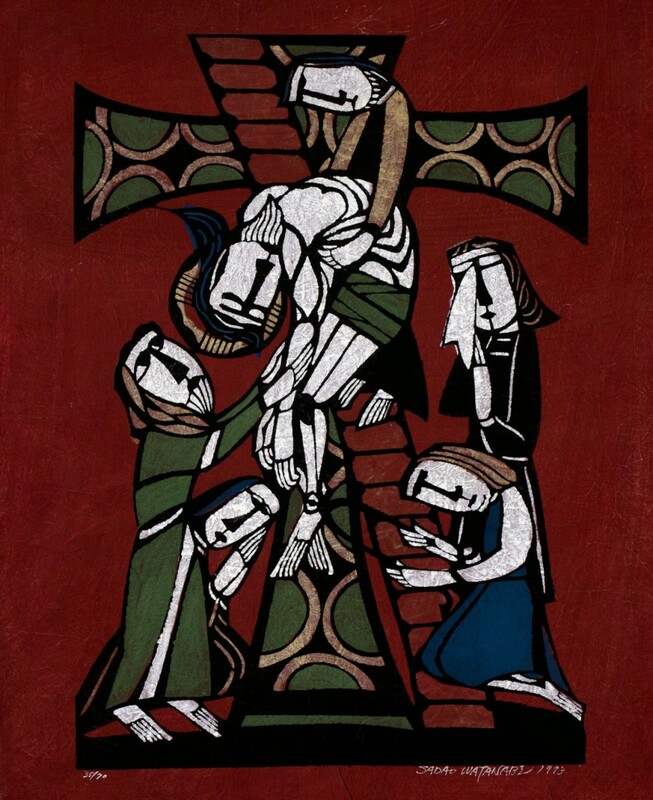 Only when we interpret the story in this way are we able to follow Christ’s example.” Jesus Washes My Feet was the title he gave to a 1969 momigami print on this theme. The conventions of western sacred art tell us that the figure crowned with the halo, kneeling beside the water basin, is Christ, and the feet he is about to wash belong to Peter. Watanabe’s stylized background in latticework patterns of stripes and circles suggests no specific moment in time or sacred geography. Any of us could be the figure sitting on the stool. Art had a redemptive purpose for the mingei movement. Yanagi believed beautiful objects had the power “of bringing down barriers between east and west and between north and south.” Watanabe might have recast this notion in the words of the early twentieth-century missionary hymn: “In Christ, there is no East nor West / In Him no South or North / But one great fellowship of love / Throughout the whole wide earth.” The birth of the universal church at Pentecost had special meaning for the Japanese Christian artist, and he found decorative ways to depict the descent of the Holy Spirit in tongues of fire [see front cover]. He dedicated his life to pulling down dividing walls, beginning with the classification of created objects into the artificial categories of fine art, decorative art, and folk art. He wanted his stencil prints to touch people in their daily lives and made his images available for calendars, published annually since 1967 by the Protestant Publishing Company of Tokyo. Watanabe also crossed ethnic and denominational boundary lines. He designed his first stained-glass window in 1985 for the Korean Christian Church in Nagoya, a major Japanese port on the Pacific coast, depicting Jesus washing Peter’s feet beneath a vine heavy with grapes. The last stencil print he completed was an image of Saint Scholastica commissioned by a Roman Catholic priory. The katazome master slipped into unconsciousness and died on January 8, 1996, while signing and numbering the momigami sheets in his studio. Watanabe knew well the heartache of the prophet without honor in his own country. 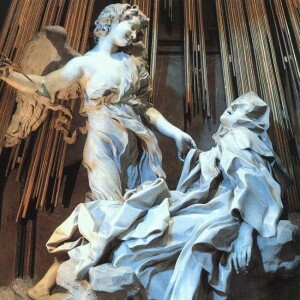 As he told his friend the art historian Jun Nishizaka: “I don’t want my works simply decorating churches. I would most like to see them hanging where ordinary people gather, because Jesus brought the gospel for the people.” Art objects are like sown seed. They may bear fruit one day in the most unexpected places, long after the crow and the sower are gone. 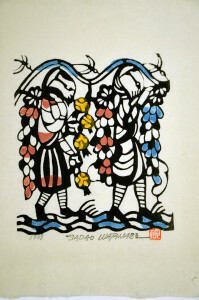 Nishizaka discovered a Watanabe print of the marriage at Cana on the wall of a teahouse in the Kojimachi neighborhood of Tokyo’s Chiyoda Ward. Anne Pyle and her husband Kenneth found a second kappazuri piece on the same theme in a family restaurant in the central Ginza district. The owners probably had a confused notion at best of the story these pieces represented, but they could appreciate them as delightful folk art prints of family and friends enjoying a festive meal. The artist would have been pleased to know that Jesus was a constant presence on the walls of such popular locales. If the Christ Watanabe followed had come to Japan, he would have welcomed an invitation to a wedding banquet, eaten declawed lobster off mingei pottery plates, and invited the waiters and the kitchen staff to be the first to taste the water turned to rice wine.